What follows is an illustration of my current understanding of concept and inquiry driven education. It has been constructed on the “shoulders of giants,” master educators whose ideas and resources I would be offensively dull without. The hope here is to add to our existing knowledge of a paradigm shift in education, to hasten it, while lessening the shock of the new. The audience is both you and I. You, as a critical listener, whose constructive feedback would be greatly appreciated. I, because these thoughts are new and cloudy, and articulation always seems to sift out the mud from the puddle. Thanks in advance for your attention. October 17th is recognized by the U.N. as the “International Day for the Eradication of Poverty.” It seemed natural to begin another year of MYP Humanities with a unit that focused on ‘Development,’ and was supported by the related concepts ‘Poverty,’ and ‘Governance.’ The unit I’m speaking of has been designed for grade 9 / MYP 4, but it could be modified to suit kids of different levels. Next, divide the class into groups, three would be ideal. Have them imagine the world as a village of 100 people. You will be playing this video, which you will want to watch first alone, and based on the statistics provided, create ten questions. Examples include: “How many would be Asian? How many would live in sub-standard housing? How many would be malnourished? How many would have internet access? How many would have a college degree? Have the kids come up with answers to these questions as a group, and write their responses on the white board. Leave one column for “actual answers.” Then play the video for the class and have a student or students write down the answers provided by the video. I find this is a great way for kids to discover how their perceptions of the world are typically way off the mark of what’s really going on. It also opens up a more in-depth discussion of what “development” means. You can ask kids why they think the world has developed in this manner, with extreme disparity in resource allocation. You may also want the kids to decide which statistic they find most troubling and why. “Poorer than Poor” by Stan and Mari Thekaekara, written for the Daily Telegraph (UK), March 10 1995. “The inhabitants here have a better life than people there. The latter is a soulless place where people are demoralized and face a meaningless future. The penniless tribesman living in a mud hut here is better off. It was a shock to us to see that the unemployed people there had cars and televisions and refrigerators – incredible wealth to many people here – and yet they were apathetic and had no hope. Around them were visible signs of drug abuse, terrible vandalism, street gangs and daily violence. Despite their possessions, they are worse off than the poorest tribesman. Here, the poor still have initiative. Every day, you see them scavenging in the garbage heaps for junk. If they find something of the slightest value, they will take it and sell it somewhere. They will do odd jobs whenever they’re available. They are doing something to keep body and soul together. But there, there’s heaviness in the air which you don’t experience here. We were trying to work out why. Then it hit us. We had never met a man here who had been unemployed for 20 years as some of the residents there. Here, people experience seasonal unemployment but not 20 years of purposeless, meaningless existence. However, the women there are different. They are still resilient and put energy and enthusiasm into various voluntary projects. The depressing factor was the lack of involvement by the males”. “This is a hard place to live, and a grotesquely easy place to die. Male life expectancy is 54, lower than The Gambia in West Africa, nearly a decade lower than Bangladesh, and about 24 years below the national average. Move just a few miles and you will live, on average, 30 years longer. Despite this, people here do not and cannot leave. For all Ms Livingston’s lament, her kids are stuck in a ghetto ringed by some of the saddest statistics in the country. The neighbourhood has the highest proportion of voters on incapacity benefit or disability allowance and the fewest qualifications in higher education; nearly half of homes are social housing; and, in parts, unemployment has reached 50 per cent”. By the time the preliminary concept mapping, discussions, video, and readings are complete, the kids should be well-aware of the concepts they will be engaged with over the coming eight weeks. It’s time to give kids specific categories through which they can view and understand ‘Development.’ I assigned a short video that discusses the U.N. Millennium Goals for 2015. Also try this. I live and teach in Hong Kong, so with a focus on the Asia region, the kids are now working in groups of three, co-creating a prezi that applies the U.N. Millennium goals to different countries in Asia. Each group has two countries that are economically underdeveloped, and one that is not. For example, a group might have Cambodia, Myanmar, and Japan. They will present this next time we meet, and we are then prepared to start discussing more in depth the explanations for the disparities between their selected countries. How should we understand these development gaps? We are then ready to look more closely at the meaning of governance, and it’s international, national, local, and grass-roots manifestations. I find these resources from the IBO very useful: Teaching about Cooperation and Governance. We will discuss, using examples from real-world situations, what is being done by different levels of governance to deal with development gaps, with a focus on poverty. For example, we will look at the effectiveness of efforts by the U.N. and the World Bank, National systems of welfare and government subsidies, N.G.O.’s such as Kiva, and what is being done locally. To a certain extent, “inquiry” is a relative concept, and can be carried out in a meaningful way within various levels of constraints. There will be opportunities as the year progresses for more wide- open, student initiated explorations. For this particular assessment, however, a moderate level of restraint was necessary for the larger purpose, which is raising awareness of a pressing issue in Hong Kong. How this pressing issue “development” is defined, how it will be investigated, how it will be illustrated, and what solutions will be offered are all left to the students. Students will also need to provide an action plan for how they will be approaching the topic, the resources they will be using, and the technology they will be employing. They will also need to write a pre-assessment on the learning strategies they will be using ( time-management, realistic goal setting ), and post-presentation reflection on how these strategies were executed, and how they can be improved upon for next time. These requirements provide a form designed to enhance the inquiry, to make it a structured learning process rather than something so open-minded that brains will drop out. At the end of this unit, I’m confident these kids will understand and be able to apply this understanding to the key and related concepts. They will be afforded the opportunity to illustrate this understanding in a real-world way, with a meaningful connection to our local community. They will also have been given the opportunity to develop their capacity as “inquirers,” by developing and implementing a research plan, deciding on an angle for the topic that interests them, discovering and sorting the relevant resources, and learning through practice how to effectively persuade an audience to join one’s cause. Before I close, I again want to say thank you to all the silent authors whose ideas and resources have inspired my own practices. So many great minds out there! If one of you happens to be listening, a few words of constructive feedback would be awesome… Thanks for the visit! Making Thinking Visible documents the results of a research project carried out by Harvard’s Graduate School of Education. The main premise is that the learning process is for the most part invisible to our students. Students are assessed on criteria such as “knowledge and understanding” but are rarely exposed to the specific components that define and distinguish these criteria. Lacking specific exposure to these components, students are unlikely to develop a meta-cognitive awareness of these processes on their own thinking. The authors ask us to imagine how the process of “apprenticeship” is carried out in non-academic domains. They refer us to the craft of brick-laying, where an apprentice is able to see the process unfold, from the mixing of mortar, to the scaffolding, to the application of the mortar, then finally to the laying of the brick. The process is modeled for the apprentice by the professional mason, so when it’s time for the apprentice to do the job of brick-laying, they know precisely how to proceed. In the classroom, we require the product “understanding” but how many of us provide a model for the processes involved in the production of this abstract term? “Good…. but what’s lacking… Kim, what are you forgetting”? Another reason why you should read ‘Making Thinking Visible’ is that the author’s provide really great “thinking routines.” I’ve heard this term used a lot this past year, so I suspect some of you are ahead of the game. For late-comers like me, thinking routines are things you do in class on a regular basis to inspire the thinking traits listed above. These routines can be as simple as a question: “What makes you say that?” By asking this simple question, a student is encouraged to “reason with evidence.” Another routine that I’ve already used to positive effect in a PD workshop was what’s called “Compass Points.” You provide information on a topic ( like changes being introduced in the MYP by ‘The Next Chapter ), you then ask the audience what E. Excites them about the topic W. what Worries them about the topic N. what Needs further clarification S. what Strategies or Suggestion do they have for improvement. This routine is easy to remember, as it’s based on the compass points, and is an effective way to inspire higher level thinking. I can imagine using this routine on topics in my Individuals and Societies classroom such as Globalization, Migration, Nuclear Energy, Development, G.M.O.’s, the list could on indefinitely. Nearly half the book is devoted to these kinds of thinking routines. All of them are easy to remember, with helpful acronyms, and the utility, the styles of thinking each routine develops, is explained in depth. 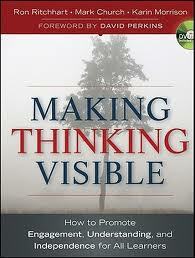 If, like me, you are pressed for time, and prefer literature with precise and thoughtful application, you will benefit handsomely from a reading of ‘Making Thinking Visible.’ For me, it’s a game changer. It’s reframed how I think of the thinking process itself, and revolutionized my methods for making these processes visible.